Here's our full guide to the Wildspire Waste area in Monster Hunter World, including everything there is to see and do in the region. The Wildspire Waste area featured in Monster Hunter World is the second full area you’ll come to in the massive game, after you’ve scoped out everything that the Ancient Forest area has to offer. In this Monster Hunter World Wildspire Waste guide, we’ll be walking you through how to find every Wildspire Waste monster in the arid area, as well as all the peaceful wildlife and vegetation you can expect to encounter. If you instead need anything else on MHW, including how to rapidly track monsters using the Scout Flies in every environment, as well as how to perfectly cook your meat on the BBQ, make sure to check out our Monster Hunter World guides walkthrough hub. Starting off at the Southwest camp in the Wildspire Waste area of MHW, you’ll venture out into the rest of area 1, where you can encounter some peaceful wildlife roaming around, as well as some herbs just to your right, and Flamenuts ahead of you. At this point, you can head directly north to come to a watery area, complete with Sleep Herbs, Herbs, and a Rathian that frequently patrols areas 2 and 3 of the Wildspire Waste. Alternatively, you can head east from area 1, coming to areas 4, 9, and 10, all of which contain swampy areas where the Jyuratodus can often be found patrolling the area. If you don’t find a Jyuratodus anywhere here, that means there isn’t one on the map at all, since the beast will never leave the swampy areas of the Wildspire Waste to venture into the more arid, dry landscape nearby. 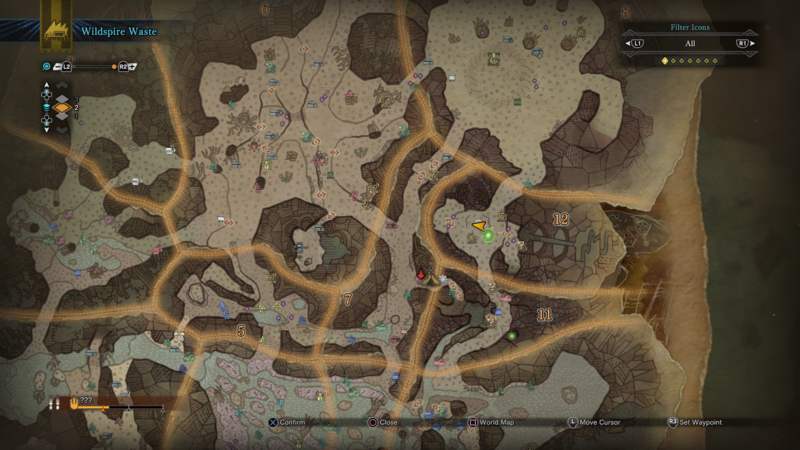 If you head northeast from area 1 in MHW, you’ll come to areas 5 and 7, both of which lie on the outskirts of the desert area of the Wildspire Waste. This is where you can frequently find the Kulu-Ya-Ku patrolling the area, which isn’t always guaranteed to attack you on site. It’s always where you can sometimes find the Barroth of the Wildspire Waste, if it happens to have roamed out of the very northern reaches of the map. Otherwise, if you’re after either the Barroth or Diablos, you’ll have to venture further northeast, into areas 6, 8, 11, and 12, where the land is typically more dry and slightly more desolate. There are fewer plants up in this area of the Wildspire Waste map, but you can find Needleberry, Slashberry, Bonepiles, Mining Outcrops, Herbs, and Kestadon roaming the area. 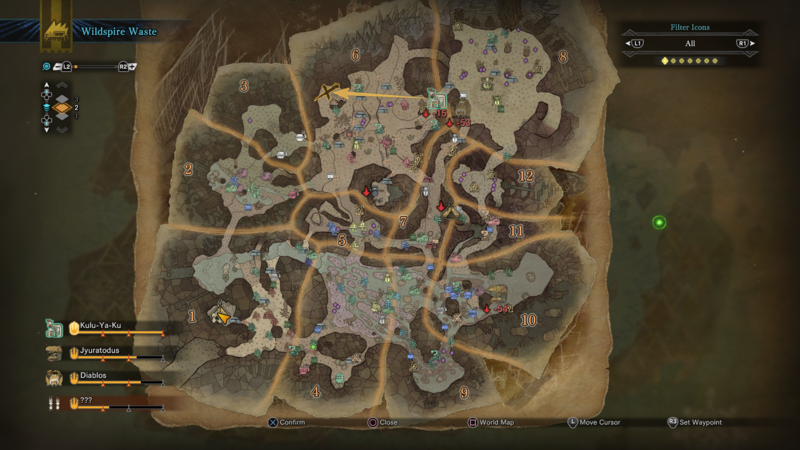 In the underground portion of area 12 you can find a the nest of either the Diablos or the Rathian. Here you’re always guaranteed to find footprints and other markings of whichever wyvern is currently in the area, and you’re also incredible likely to find a Wyvern Egg there, which picking up will instantly summon the wyvern to your area. It’s useful if you’re looking to take down a Rathian or a Diablos. We might be done with the Wildspire Waste, but this doesn’t bring an end to our MHW guides. Continue ahead to our comprehensive Barroth guide, detailing how to take down the monster, or our extensive weapons guide.